1. Using an electric whisk, beat the butter and sugar together until pale and softened. Add the vanilla, egg yolks and flour and continue to whisk together to make a soft dough. Wrap in clingfilm for 1–2 hours until firm. 2. Heat the oven to 180°C, gas mark 4. On a lightly floured surface, roll out half the dough to the thickness of a pound coin. Using a 7.5cm cutter, stamp out 12 circles. 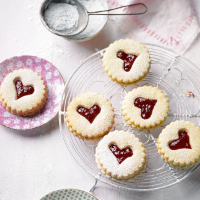 Using a smaller cutter (try a 2cm circle or a heart or star shape), stamp out the centre of each biscuit. Place on a large, lined baking sheet. 3. Add any trimmings to the rest of the dough then roll out and use to make a further 12 rounds. Place on a second large, lined baking sheet. Bake the biscuits for 10–12 minutes until pale golden. Remove from the oven and leave to cool and firm up on the baking sheets. 4. Place a large teaspoonful of jam in the centre of the base biscuits and spread out a little. Press on the top biscuits and dust with a little more icing sugar to serve.